At Access Denied, we can offer car key replacement in Watford for almost any make and model of vehicle. Using our expertise, experience, dedication to helping others and mobile setup we can have a brand new key with you as soon as possible. If you find yourself without your key and unable to drive, simply contact the Access Denied team and we’ll be with you in no time. When it comes to keeping track of your car keys, it isn’t always easy. Whether you’ve put them down at home and they’ve disappeared or you’ve lost them whilst out and about, missing car keys can be a major stress. After all, without car keys, how are you going to use your car? Not only do you need a car to get to work and to the local shops, but the chances are you also need it to ferry the children around, to visit friends and in case of emergencies. This is why car key replacement in Watford is a service that’s commonly used. Car keys are one of the most commonly misplaced items for both men and women, so it should come as no surprise that there’s a high demand for car key replacement in the UK. However, a lot of people worry that they won’t be able to have a new car key made or that they will struggle to find a car key replacement service if the car is an unusual make or model. Luckily, this isn’t the case. As long as you choose a professional mobile car locksmith, there’s no reason as to why you need to be without your car key for too long. At Access Denied, we understand that you may not have any of the original car keys and that’s why we’re able to replace keys without them. Our mobile car key replacement service is on call 24 hours a day and we keep a stock of almost every car key out there, which means you don’t ever have to worry about losing yours. Within mere moments, we’ll have you back on the road and mobile. At one point or another, most people will lose or misplace their car keys. Though you may put a great deal of effort into ensuring you know where they are at all times, car keys tend to disappear without a trace and at the most inconvenient moments. Not only does this leave you unable to access your car, but it also leaves you unable to drive anywhere. If you have work to travel to or somewhere important to be this can be a huge problem, especially if you have no other mode of transport. Now, if you planned in advance and have a spare key already, you’ll be on your way immediately. However, hindsight is a wonderful thing and most people don’t have a backup. So, what’s the answer? When you lose a car key, it’s time to call an auto locksmith in Watford. A professional auto locksmith in Watford will have you back on the road in no time. With state of the art technology and modern solutions, there’s no reason why you should wait for a replacement key. In fact, with a mobile car locksmith helping out you’ll have a brand new key in a matter of moments. At Access Denied we understand the stress and annoyance that comes with misplacing a car key and this can quickly turn into anger when you realise it’s gone for good, but that’s where we come in. With a mobile setup and a 24 hour service, we’re able to offer replacement keys quickly. Not only does this cut down on the time you’re left without access to your car, but it also means you don’t have to travel far in search of a replacement key. As we stock keys for most makes and models at all times, a quick phone call is all that’s needed before we’re on hand to help. As professional car locksmiths, the Access Denied team have helped a number of car owners and we’re always available to help more. Our top quality facilities and mobile setup mean we can be with you shortly after you make the call. Though it’s always helpful to have a spare set of car keys, not everyone does. So, when you find yourself with missing keys, it’s important to act quickly to ensure you have a replacement on its way. Whether you’ve locked your key in your car or you’ve lost your key altogether, there’s no need to worry. Simply, contact a car locksmith in Watford and let the professionals take care of everything. When you choose Access Denied as your car locksmith in Watford, you are guaranteed a first class service. This includes a professional team who are able to assist with any lock or key problems, fantastic customer support and quick a response time. We understand that realising you’ve run into a bit of bother with your car can be a stressful time and that’s why we work hard to ensure the entire process is as simple and straightforward as possible. Whatever the problem, the Access Denied locksmiths are able to help. With state of the art equipment and the latest technologies, we’re able to offer an unmatched mobile locksmith service. We stock a wide range of spare keys and tools, which allows us to offer locksmith services to almost all vehicle makes and models. Even if you find yourself worrying as the car is an older model or an uncommon make, the chances are we’ll still be able to help. At Access Denied we work 24 hours a day, 7 days a week. This allows us to ensure we’re always available when you need help. After all, you can never be too sure of when car keys will go missing. Plus, as we’re completely mobile, we’re able to come to your rescue regardless of where you are. Whether you’re stuck on the driveway or in a supermarket car park, the Access Denied team can assist. As we are a team of experienced locksmiths, we’re able to offer a professional service from start to finish. This is why we’re many people’s first port of call when they find themselves without their keys. With top quality facilities and a fantastic mobile setup, we’re only moments away. Though everyone would like to think of themselves as someone who doesn’t accidentally lock their keys in their car, this isn’t always the case. In fact, a surprising number of drivers find themselves locked out whilst their keys are locked in; it’s an easy mistake to make. Not only does this mean you won’t be driving anywhere anytime soon, but it also means there’s no way to access whatever it is you’ve left in the car. Luckily, when it comes to keys locked in car in Watford, Access Denied are on hand to help. Realising your keys are locked in the car can be stressful especially if you have a child, pet or something else valuable inside. However, with professional mobile locksmiths just moments away, there’s no need to worry. In fact, the entire ordeal will be over before you know it. It may be tempting to try and pick the lock yourself, but this isn’t something that’s advised. Without the right training and knowledge of the necessary techniques, it’s likely you’ll cause more harm than good. If your keys are locked inside the car, a professional auto locksmith will be able to pick the car lock using specially designed tools and equipment. This ensures entry to the vehicle can be gained, without causing any damage to the car or its lock. 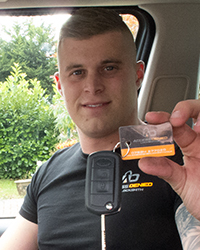 Over the years, the Access Denied team have gained access to a number of keys locked in cars in Watford. Each member of the Access Denied team has been professionally trained in safe entry methods, meaning there’s never any risk of damaging the vehicle. Whether you’ve locked your keys inside the car yourself or it was the result of children messing about, we’re on hand to ensure you can get into the car as soon as possible. At Access Denied we offer a 24/7 mobile service; this means we’re able to help you any time, any day. Plus, as we’re mobile, there’s no need for you to leave the vehicle. If your keys are locked in the car all you need to do is give us a call and wait, we’ll come to directly to you.